CITY of Plymouth’s Poppy Northcott is now topping the UK under-13 rankings at three different track distances. 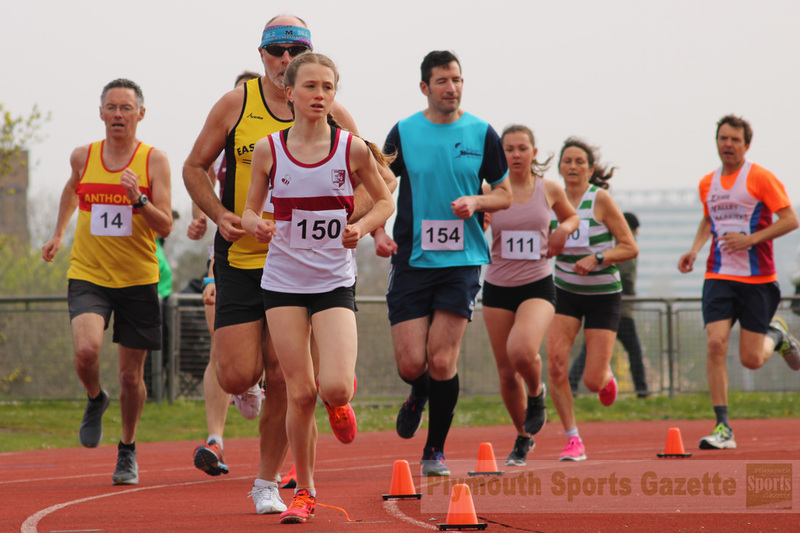 Northcott had gone to the top of the 800m rankings last week after winning the two-lap race at the Bournemouth AC meeting with 2:22.9. The youngster then moved to the summit and also on to the all-time list of the 1,200m rankings with a 3:47.0 run at the Newquay & Par meeting on Saturday in Cornwall. She then backed that up by running a UK-leading 600m time of 1:40.4 at the City of Plymouth Spring Open Meeting at Brickfields on Sunday. That also puts her in the top 15 on the all-time list. Northcott’s run was just one of a number of impressive displays at the Brickfields season-opening event. Tavistock under-17 athlete Edward Fileman produced three personal best displays in throwing events, two of which were UK top three leading performances. On his first outing of the season, he went straight in at second in the hammer list with a 57.34m throw. He is also third in early national discus rankings with 42.23m, while he also managed another PB in the shot of 11.43m. In the women’s hammer, under-20 athlete Lois Fileman threw 37.73m, while in the under-17 age group her Tavistock team-mate Hannah Gellatly managed 37.24m. Lois Fileman also won the discus with 31.23m, while City of Plymouth’s Nubia Evans-Shields, who had set a UK under-13 leading distance of 32.68m the day before at Par, managed another impressive performance of 32.27m. In the shot, Tavistock’s Nicolas Maczugowski won the under-13 event with 8.10m, while Erme Valley’s Paige Johnson set a new PB of 8.78m to win the under-17 girls’ competition. Multi-eventer Emily Bee won the women’s under-20 javelin with a throw of 30.33m. She also won her 200m race in a quick time of 25.7 seconds, which puts her in the UK top 30 for that event. In the under-13 long jump, City of Plymouth’s Rosie Northcott set a new PB of 4.38m, which ranks her 22nd in the UK. 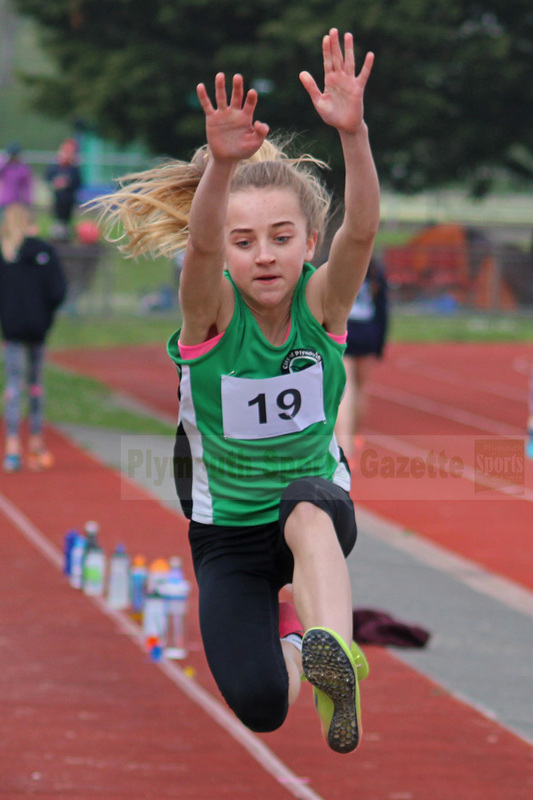 She also set a new PB in the 100m of 14.4 seconds, while in the under-15 long jump fellow Plymouth athlete Kinga Kudzia jumped a PB of 4.70m. In the under-20 men’s long jump, Tavistock’s Josh Davies set a new PB of 5.76m. There were some good sprinting performances on Sunday. Tavistock’s Jamie Bulbring impressed in the under-17 category with a 12.9 second 100m run and a 42.1 second performance for the 300m. Both those times rank her in the UK top 30. In the same age category Erme Valley’s Paige Johnson and Estelle Hodges both sets PBs of 13.5 seconds for the 100m. 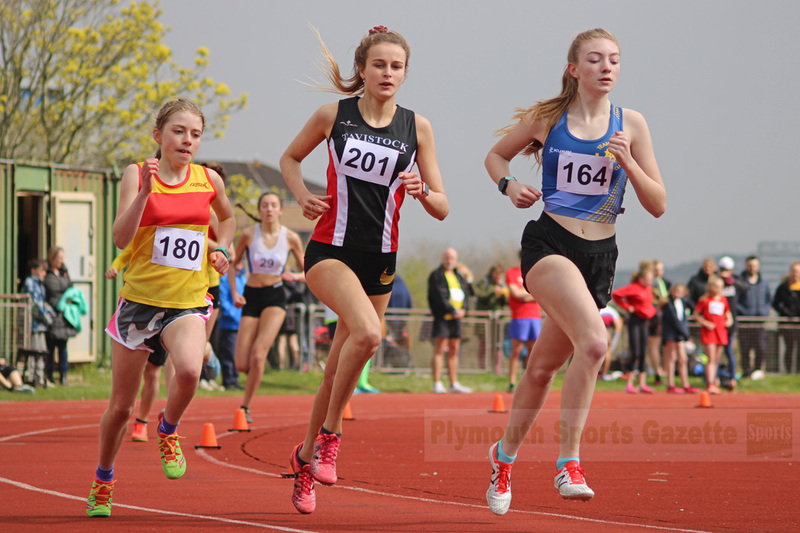 In the under-15 girls’ 100m, City of Plymouth’s Lili Fern ran 13.1 seconds, with her club colleagues Kinga Kudzia and Mali Heard just behind her with PBs of 13.3 seconds. Heard impressed in the 200m with a PB time of 26.6 seconds, while Fern also set a new best with a 27.2 second run. Tavistock’s Jade Kinsey won the women’s 100m and 400m with times of 13.0 and 59.7 seconds, respectively. In the men’s sprints, City of Plymouth’s Tom Roberts won the under-17 race with 12.0 seconds, while team-mate Connell McCarthy ran a PB time of 12.2 seconds in the under-15 age group and also set a new best of 24.3 seconds in the 200m. 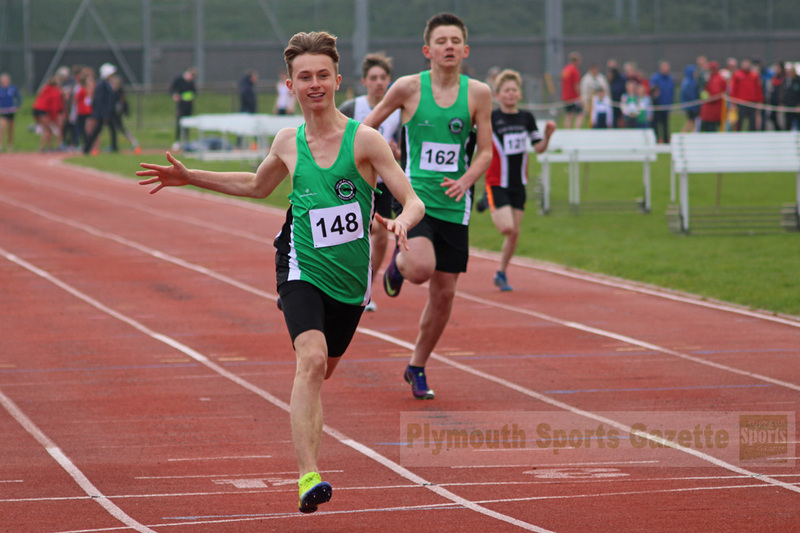 Plymouth’s under-17 athlete Henry Curtis ran 25.6 seconds for the 200m and a PB of 57.4 seconds for the 400m, where his older colleagues Matt Summers and Dan Newland ran 54.1 and 56.1 seconds, respectively. Plymouth’s Dean Smith won the 800m in 2:02.8, with Tavistock’s Natasha Farrington finishing as first women in 2:25.3. Tavistock’s Joe Beaton won the 1,500m in 4:32.6, while Plymouth’s Thomas Jones set a big new PB of 4:51.2 having just moved up to the under-15 group. There was also an impressive run by Plymouth’s Holly Reid, who clocked a PB of 5:19.1 to move up to 15th in the UK under-13 rankings. Team-mate Verity Tank ran 5:26.4 in the same age group, which ranks her 26th. Plymouth’s Oliver Woodmason was the runaway winner of the 3,000m in a 10.05.2, while Bradley Stevens took victory in the 3,000m steeplechase in 11:24.1. Erme Valley’s Estelle Hodges claimed honours in the under-17 80m hurdles with a time of 12.9 seconds, while team-mate Olivia Travers won the same age group’s 300m hurdles in 49.8 seconds. In the under-15 girls’ high jump, Erme Valley’s Ella Isaias leaped 1.55m to win, with Plymouth’s Erin Muldoon jumping 1.50m.